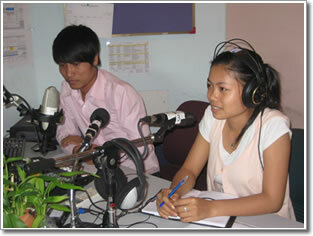 FEBCambodia is a Christian radio mission based in Phnom Penh. We communicate God’s love in the Khmer language through FM and short wave radio broadcasts, and through personal contact with our listeners. Through the transforming power of the Gospel, we want to see Cambodian families and individuals experience HEALING from the past, receive HELP today, and enjoy HOPE for the future. FEBCambodia is a member of FEBC International. Broadcasting every day , FAMILY FM potentially reaches 10 million - that is, two-thirds of Cambodia's population. FEBCambodia’s short wave service Voice of Love, broadcast from FEBC’s station in the Philippines, is on air for an hour morning and evening and reaches the whole country.